Carolina Panthers quarterback Cam Newton has taken a beating in his NFL career, far more than any quarterback in recent history. And suddenly, at the still-young age of 27, Newton is facing the first flash point between playing style and long-term future. Newton is officially cleared to return from a concussion suffered when he tried scrambling into the end zone in Week 4. The play, and his subsequent one-game absence, was a reminder that no quarterback -- not even one who broke into the league with a patented "Superman" celebration -- can indefinitely absorb unnecessary punishment without consequence. Ahead of Sunday's game in New Orleans, let's take a closer look at what Newton has exposed his body to during his six-year career. The Panthers say they won't limit his running or impose a fundamental change in their offense, but we'll consider a suggestion for lessening the toll nonetheless. 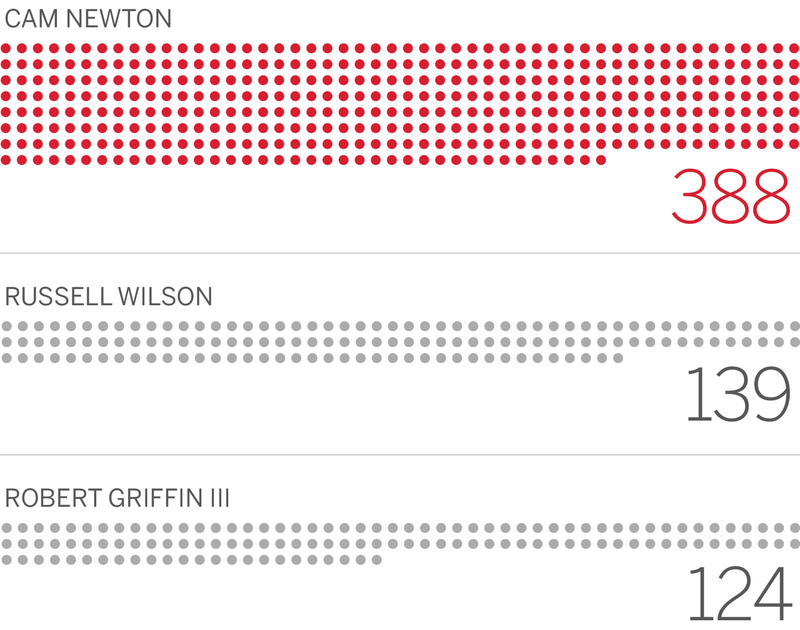 Newton has been hit on 831 plays over 82 games in his career, an average of about 10 per game. The number may sound small, but it is actually extraordinary in the context of other quarterbacks. The next-closest quarterback has taken nearly 300 fewer hits over the same time period. This tally includes every play he has been hit on while either on the run or while throwing, but it is capped at one hit per play and doesn't include contact after the throw or on two-point conversions. This level of contact has occurred for a variety of reasons. First, Newton has displayed an admirable but ultimately dangerous trait of holding the ball while looking for open receivers. Since entering the league in 2011, he has averaged more time per pass in the pocket than all but one qualified quarterback. Playcalling designed to maximize his strengths also has played a role. Since 2011, the Panthers have called more than twice the number of designed runs for Newton than any other team has for another quarterback. And they have resulted in 1,941 rushing yards, more than double Russell Wilson's 833. Nearly two-thirds of Newton's designed QB runs have gone between the guards, where maximum contact occurs. Newton also has taken off on more scrambles -- runs when a pass play breaks down -- than anyone but Wilson over this span. In all, Newton has been hit at least once on 533 of 575 plays that were either designed runs or meaningful scrambles in his career. The Panthers have carved out this style in large part because Newton is really good at it. He has run for 258 first downs in his career, nearly twice as many as the next-best quarterback over that period. And at 245 pounds, he has managed to run for more than twice the amount of yards after first contact than anyone else. So what's the solution here? As simple as it sounds, longevity in the NFL can be associated with the number of hits a player takes. There are strategies for minimizing contact, from throwing the ball more quickly to limiting scrambles to purging designed runs. Look at the three quarterbacks who have taken the fewest hits by percentage since ESPN Stats & Information began tracking them. One retired at age 41, another retired at 40 and a third is still playing at 37.